Oysters come into the market around November and you can see them until Spring. Full of nutrition such as zinc, iron, calcium along with Omega-3 fatty acid, oysters are a popular choice of seafood during the winter month. Popular Japanese dishes using oysters are nabe (hot pot), deep fried panko oyters, oyster stir fry, and raw oysters with ponzu (citrus soy sauce). So, if you are an oyster lover, do have a go at the oysters in the supermarket. But remember, choose the right oyster for your purpose. 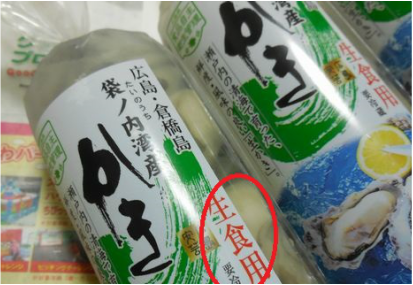 Basically there are two kinds of fresh oysters sold in the market, oysters for cooking (加熱用）and oysters to eat raw (生食用). You can use oysters for eating raw to cook but never the other way around. 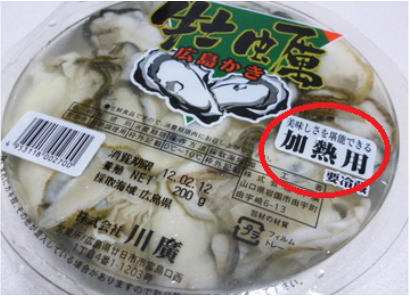 Food poisoning from oysters are a common illness (Notably Noro Virus) so please follow the labels. Most people think that the oysters for eating raw are more fresher and better in quality, but in actual fact it is where the oysters are harvested that makes the difference. Harvested in designated areas where the Local Heath Center has tested it's water. It is usually offshore where the water is more cleaner and less bacteria. 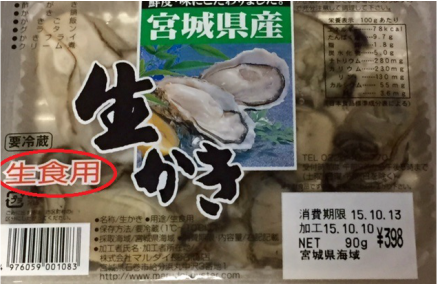 In addition, these oysters are fasted for a couple of days before they are disinfected and approved to be sold in the market. Which means that they have less flesh in them and not have as much nutrients as well as flavor. There are several ways to clean oysters. Using a grated daikon radish is a common way. I am too lazy to grate the daikon so I use potato starch (片栗粉). Clean oysters just before cooking. Put the oysters in a bowl. Sprinkle a Tablespoon each of salt potato starch(or corn starch/corn flour) and gently mix with your hands for about 10 seconds. Add 3 Tablespoons of water to the oysters and mix for another 30 seconds. The starch will collect the dirt from the oysters and you will see the water turning gray. Rinse with cold water (preferably salted water) until it is clean and the water is clear. Dry with a paper towel and prepare according to the recipe. Do not leave the oysters in fresh water as the flavor will run out and you will end up with shrunken oysters when you cook.